NBM Publishing is releasing two brand-new paperback volumes of Salvatore, a full-color graphic novel series by Nicholas De Crecy (translated into English). In an anthropomorphic world, a small dog named Salvatore is a mechanical genius, famed for his abilities to fix cars and construct all sorts of machines from car parts. And he longs to use his talents to construct an all-terrain vehicle which will take him around the world — or through it if need be — to reach South America, where his lady-love Julie has moved. That’s the plot of Volume 1, Transports of Love, which was released in January. In Volume 2, An Eventful Crossing (which arrives this December), our canine hero embarks on his journey, crossing up through Russia toward the pole — avoiding the seas, of which he’s deathly afraid — and meeting new friends and new adventures on the way. Check the whole thing out on Amazon. Anthroview is a brand-new furry-themed magazine created by long-time fan Summercat. According to the web site it’s “dedicated to providing reviews and articles relevant to the Furry Fandom” and “will be reviewing artwork galleries, stories, animations, comics, costuming, games – anything and everything made for the furry fandom by the furry fandom”. Issues are going to be available in both electronic and traditional print formats. The first issue will be premiering this week at Antheria in California. Flayrah has an interview with Summercat discussing his plans and aspirations for the new magazine. An interesting black & white manga that we somehow missed last year… Now it’s being re-published in English by Kodansha Comics and Random House. 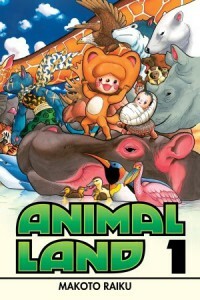 In Animal Land (written and illustrated by Makoto Raiku) we are introduced to an alternate earth inhabited by only non-human animals. After losing her family to vicious predators, a tanuki (raccoon dog) named Monoko makes an amazing discovery in a river: A human baby! Now this strange, unknown creature will grow up among the animals and will soon begin to display amazing powers. Volume 1 was released in August, and Volume 2 is coming up soon in October. Here’s a review at Good Reads. Some reviews just nicely write themselves. 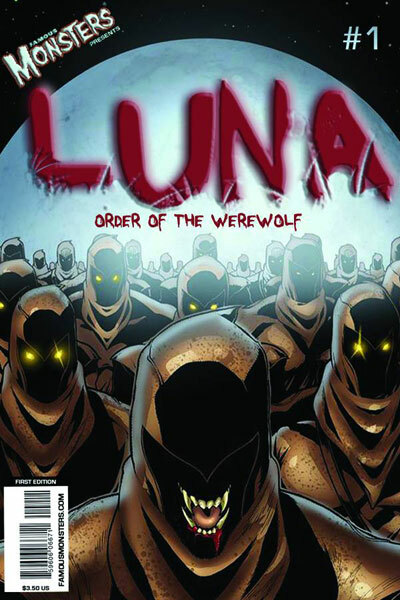 Like this one for Luna: Order of the Werewolf, coming this October (of course) from Famous Monsters of Filmland (which is now publishing comic books! ): “Relentlessly hunted through the years and finally threatened with extinction, Brother Andres gathers the species of werewolf to take sanctuary in a monastery called Luna. High on the snow-capped mountains of South America these werewolf monks live a daily life of struggle away from the temptations of the hunt and relentless persecutions, until a mountain expedition stumbles onto the very rock Luna rests upon. The fragile balance Andres and the monks have constructed is about to explode!” This 4-issue mini-series is written by Mark L. Miller and Martin Fisher, with full-color illustration by Tim Hope. Here’s more about it from Westfield Comics. Archie Comics have announced the upcoming release of Sonic the Hedgehog Legacy, Volume 1 trade paperback this coming October. 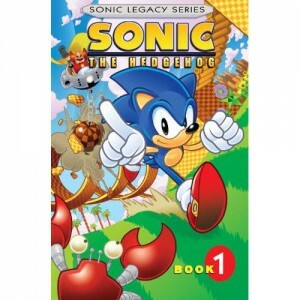 It’s part of a whole series of new Sonic the Hedgehog graphic novels that Archie will be releasing soon in a larger format to try and appeal to older readers. Publisher’s Weekly has the skinny on all of that. Meanwhile, Legacy features over 500 pages of Sonic and the Freedom Fighter’s early adventures, collecting together issues #0 – #3 of the original Sonic mini-series and issues #1 – #16 of the ongoing series. 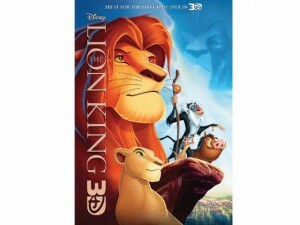 It’s all over the news, and now it’s here too: Not only did the 3D re-release of Disney’s The Lion King top the box office this weekend; not only did it double movie industry expectations… it also did more business than the three new big-studio releases for the weekend did combined. This new infusion of box-office cash raises the biggest hand-drawn animated film of all time from #25 to #17 on the list of all-time biggest domestic box office. 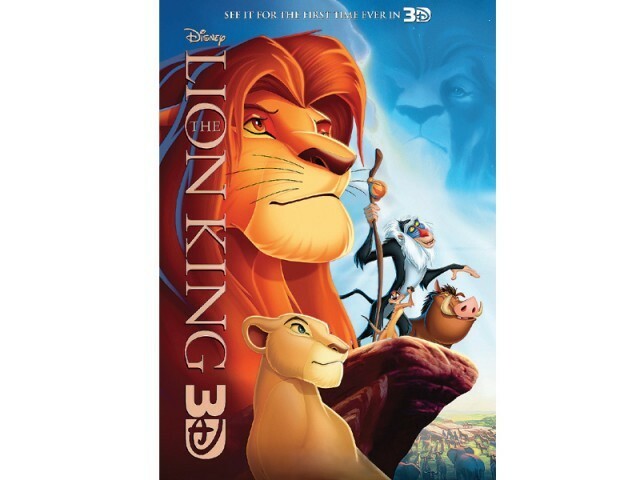 Of course, the film is only going to be in theaters for two weeks, all in anticipation of the new Blu-Ray release of The Lion King on October 4th — and yes, that will include the 3D version for your home. “It means more furries… for the rest of our days…” Well, we can only hope. 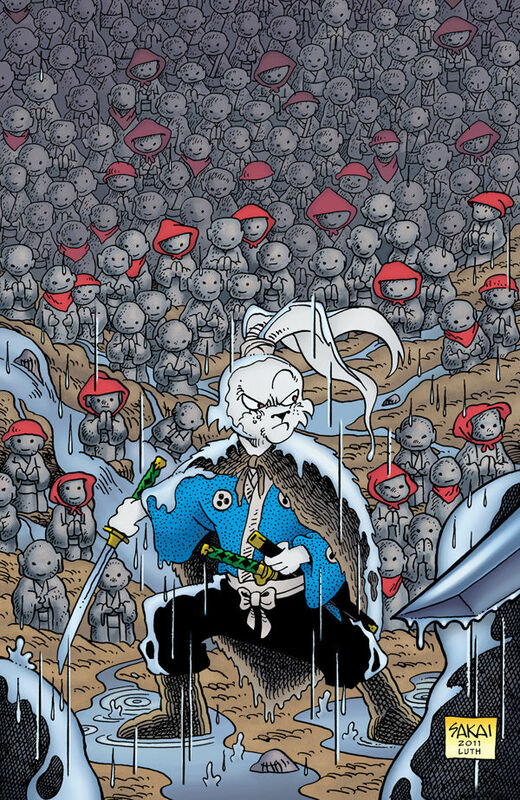 Issue #141 of the multi-award-winning black & white comic book Usagi Yojimbo marks a special milestone: It’s the 200th issue over-all of the series created, as always, by Stan Sakai. And to celebrate, Stan has created a special self-contained story for this historic issue, 200 Buddhas. “With a ruthless gang terrorizing his small town, a humble stonecutter receives a vision and sets out to carve two hundred stone figures. Just as he has finished the 199th, a long-eared stranger comes to his door seeking shelter from the rain!” That long-eared stranger, of course, is the warrior rabbit that furry fans love. Usagi Yojimbo #141 hits the stands from Dark Horse Press this October. Bill Willingham is best known as the creator of the Fables comic book series — which has, of course, taken more than a few furry turns itself. 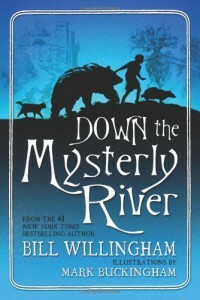 Now he’s trying his hand at a different sort of creation: A hardcover graphic novel for young readers called Down the Mysterly River, illustrated by Mark Buckingham. Here, we’ll let Amazon explain: “Max ‘the Wolf’ is a top-notch Boy Scout, an expert at orienteering and a master of being prepared. So it is a little odd that he suddenly finds himself, with no recollection of his immediate past, lost in an unfamiliar wood. 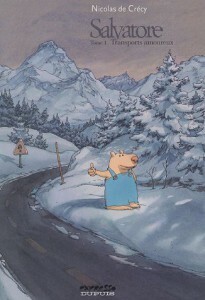 Even odder still, he encounters a badger named Banderbrock, a black bear named Walden, and McTavish the Monster (who might also be an old barn cat)—all of whom talk—and who are as clueless as Max. 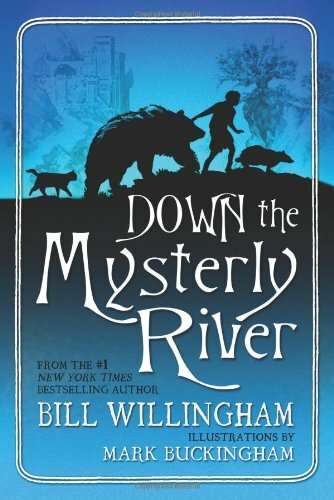 Before long, Max and his friends are on the run from a relentless group of hunters and their deadly hounds. Armed with powerful blue swords and known as the Blue Cutters, these hunters capture and change the very essence of their prey. For what purpose, Max can’t guess. But unless he can solve the mystery of the strange forested world he’s landed in, Max may find himself and his friends changed beyond recognition, lost in a lost world… ” It’s available now from Starscape. We don’t need to tell folks around here that dragons — talking, magical, and otherwise — have held a fascination that is unique for centuries. 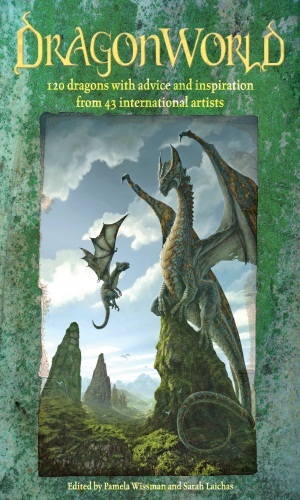 Now editors Pamela Wissman and Sarah Laichas have gathered together 43 international artists to give their interpretations of these fantastic creatures, and put the results together in a full-color book called Dragon World. It’s available now in hardcover from Impact Books. It features more than 120 illustrations, from whimsical to magical to scarey, as well as interviews with the artists discussing their take on dragon legends. Check out the reviews at SF Book.com and Amazon.